Wildfire season has finally slowed but, like it or not, now is the time to start getting your property ready for the 2019 fire season. In the summer edition of Stewardship Notes we focused on Zone 1 – Be Ember Aware. In this edition we will focus on Zone 3 – Reduce the Intensity Zone (keep an eye out for Zone 2 in the spring!). Zone 3 is the area outside of your yard and garden, most of us would call it our woods or forest. This zone can extend up to 300 feet from the structure you are working around. The goal in Zone 3 is to reduce the intensity of wildfire. Instead of having 20 or 30-foot flames going through your property, we want much smaller flame lengths. These smaller flames reduce the damage to your property and make firefighting resources more effective. To accomplish this, we need to work on reducing the amount of fuel that can cause large flames. Typically what gives us the large flames in a wildfire are trees. So this article focuses largely on thinning the forest in your third zone. Check out the Stewardship Notes article from August 2016 to learn about all of the benefits of forest thinning (besides wildfire protection). From a fire perspective, we are trying to thin trees to get what we call “roads in the sky”. Roads on the ground often act as a fire break by slowing or stopping fire spread, but we also want these fire breaks in our tree tops. When you look up into your trees you should see a minimum of 5-6 feet between the tips of the tree branches. This creates fire breaks in the sky to reduce the chance of tree-to-tree ignition. Further spacing is recommended on steep slopes and as you get closer your house. If you prefer, you can leave small clumps of trees as you thin your forest, but be sure to isolate those tree clumps from surrounding trees and other clumps you may create. People will often leave these for wildlife or aesthetic values. Check out this article to learn how to conduct a wildlife friendly fuel reduction project. Once you have thinned your trees the next step is to remove “ladder fuels”. Ladder fuels carry fire into your tree canopy from the ground. A tree with branches that start at the ground and reach up to the canopy create a “ladder” of fuel that can carry flames from the bottom to the top. Ladder fuels can also occur when you have grasses or brush in contact with low branches. To eliminate this ladder we recommend pruning the branches off of your trees. 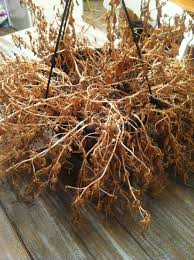 It is recommended to prune them up to ten feet, but never more than half the tree (so if you have a 12-foot tall tree, you only prune up to six feet). This is to maintain a healthy living crown in the tree. Disposing of the pruning slash is an important next step. Most homeowners will burn it in piles or chip the material. The September 2017 Stewardship Notes has an excellent article on burning piles. However, either method will help reduce fuels on the ground and the height of flames, were a wildfire to occur. If you decide to chip, the material should be piled or scattered. When scattering, keep chip depth less than six inches, preferably less than three inches where possible. See the April 2018 Stewardship Notes article about chipping. Enjoy the nice fall weather and start thinning some of your trees to be ready for the 2019 fire season. Keep an eye out for the Spring Stewardship Notes edition for the final article in this series covering Zone 2. As always, for more information on preparing your home for wildfire, check out the National Fire Protection Association website. Wildfire Corner: Be Ember Aware! It is time to go on vacation but before you leave, ask yourself: Will my home survive a wildfire? I’ll share with you some simple things you can do right before you go on vacation to decrease the chance of your home burning should a fire occur in your neck of the woods while you’re away. Embers, not flames, from wildfires are what ignites most of the homes that burn during a wildfire. Embers are small pieces of burning vegetation that are carried into the air and can often land over a mile away. Another way to look at embers is as matches falling from the sky. So what can a homeowner do before going on vacation, or at any time? Here are a few tricks that take less than 15 minutes to implement. When talking fire, we call the area around your home the Home Ignition Zone, which consists of three smaller zones. For the purposes of this article, we will focus on what is called the “Immediate Zone,” where ember awareness is critical. This zone is defined as the area your house sits on plus 5 feet on any side (click here to learn about the other parts of the home ignition zone). In the Immediate Zone, it is very important to get rid of anything that a wandering ember could ignite. One way to think of this when looking around your Immediate Zone is: Could a single match get a fire started here? If the answer is yes, remove that material! Door mats made from flammable material. While this list may seem long, the process of identifying and removing fire ignition hazards is easy: Simply walk around your house and look for anything that could catch fire if an ember landed on it. When you find something remove it. Today I walked around my house and storage sheds and found a pair of cotton gloves, some 2x4s, and a pile of dry leaves. I put the gloves and 2x4s in the shed; the leaves I raked up and put in my compost bin (which is 30 feet from my house). Within 15 minutes I had completed a fire safety check for potential ember hazards around my house. Now I can leave knowing that I have reduced the chance of an ember burning my house down. Are there more things you should do to protect your home from the next wildfire? There are lots of other tasks you could do in the other parts of the Home Ignition Zone, but they take longer than 15 minutes. Some tasks are better to do in different seasons. 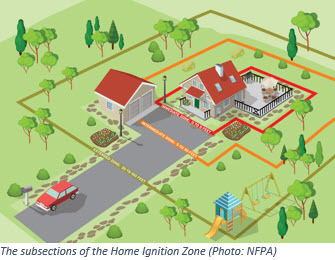 Keep an eye out for the next installment of Wildfire Corner, where we will discuss the other ignition zones — the Intermediate Zone (5 to 30 feet from the home) and the Extended Zone (30 to 100 feet or more) — and the prevention goals for each in more detail. For now, make sure you check your Immediate Zone before you go on your summer vacation. Whether it’s just for the weekend or a two-week road trip, always remember to do your fire safety check! Check out this website for more information on the Be Ember Aware program. It’s winter. Are you ready for the next disaster? It could be a wildfire, a major winter storm, an earthquake, or even a train derailment that spews harmful chemicals. In this and future articles we will look at ways to be prepared for disasters. There are some simple steps we can take now to reduce the impacts on us and our families when the next disaster occurs — whether it is natural or manmade. Let’s talk first about communicating with your family and knowing everyone is safe during and immediately after a disaster. During a one of these events cell phones and land lines may be disrupted. With this potential problem in mind, develop a backup plan and ensure that everyone close to you knows how to use it. Text each other (texting uses less bandwidth and may work when voice calls cannot get through). Family members also can use other channels—email and social media—to communicate with each other. The most important thing to do now is develop a plan and share it with all family members and others with whom you want to stay in contact during and after an emergency. Whether you are at home or off on vacation, you will want to know whether your home was impacted by a disaster. Most counties have some type of Emergency Notification System to alert you of time-sensitive general and emergency information. These notifications do not always go to everyone but they try to target a geographic region based on zip codes, street names or the entire county. Reverse 9-1-1 is one example of this type of emergency notification. In the county where I live it is called Alert Spokane to see the Spokane County system, which offers to send notifications to an email address or a text them to a mobile phone. For these notification systems to work, you need to register with your county’s Department of Emergency Management, usually via its website. Click here for a list of county emergency websites in Washington state. Remember, one of the first things to do before the next disaster is to develop a plan to communicate with your family and stay informed. How devoting a few minutes of your holiday gatherings to get this done? In the next article we will talk about building a preparedness kit. For more information on being prepared for the next disaster visit the website of the state Emergency Management Division. Building these slash piles many weeks before burning allowed the materials to dry out and be almost fully consumed when eventually burned. Photo: U.S. Forest Service. With fall weather just around the corner people are starting to think of when and how they will burn this year’s silviculture (forestry-related) debris. Outside of a designated Urban Growth Area (UGA). Here are some tips to ensure you are successful and safe when burning silviculuture debris this fall and winter after temperatures cool and fire dangers recede. Know the rules – Visit DNR’s Outdoor Burning web page to see if you need a permit to burn. Not all outdoor fires require a permit. Whether or not you need a permit, be sure to call 1-800-323 BURN or check DNR’s fire danger web page before you burn. DNR monitors local fire dangers and air quality issues through the year and may need to restrict or shut down outdoor burning in some areas, even in winter. Locate the pile in a good place – Piles should be 10 to 20 feet away from trees, and 50 feet from structures. Larger slash piles may need to be further away. If protecting your trees is a concern, make sure to burn on a calm day. Wind can easily push a fire’s heat sideways and scorch trees more than 20 feet away. Be aware of what is under your slash pile, too, because burning can damage soil as well as tree roots. Building tall piles are better – A taller pile is better because it often will burn cleaner and hotter. Just like building a campfire you want to form a pyramid of material. At that bottom of that pyramid you’ll need tinder and kindling to get the larger material above to burn. Needles and small twigs are excellent sources of tinder and kindling to get your slash pile burning efficiently. Start building piles in spring and summer – Building burn piles in the spring and summer allows them to dry out before fall. Dry material ignites easily and will burn cleaner and more completely. Cover piles before fall rains – When summer nears its end, cover between a quarter and a third of your slash pile so there will be a dry spot to ignite it. Pick the area you cover carefully; it should have enough dry, fine fuels to easily ignite. Tarps or plastic sold in large sheets make excellent slash pile covers. For a more economical solution, check with local lumber yards to see if they are giving away used lumber wraps — the materials lumber mills use to cover the loads of 2×4’s they ship to lumber yards and home improvement stores. Build a fuel break around your pile – Clear away all flammable debris for at least 24 inches around your slash pile to prevent the fire from spreading. If your burn is one that requires a permit, follow any special directions indicated on the permit. Burn with snow – If you live where it gets cold enough for snow to stick on the ground, wait until a couple of inches of snow have accumulated before igniting your pile. If you are not in snow country, burn after several good rains to insure that the ground and any nearby vegetation are moist. Burn in the fall – Fall or early winter are great times to burn because your material will be dryer than if you waited until spring. Fall burning also takes advantage of the approaching wet, cold winter weather that can help assure the fire stays out after the burn. Statistically, most wildfires caused by escaped outdoor burning occur in the spring, not late fall or early winter. Ignite your pile with a propane torch – A propane torch is a safe and efficient way to get piles ignited. Never, ever use gasoline to ignite a pile. To see what can happen if you use gasoline, visit www.youtube.com and type in “gas brush piles ignition” to see videos on the many things what can go wrong when you use gasoline to ignite slash piles. Now that you’re online, google “propane torch” for find places to buy a propane torch if you don’t already have one. Check your pile – Check your pile after you think it is out. Use a shovel to dig in the pile’s ashes to ensure that it is truly out. 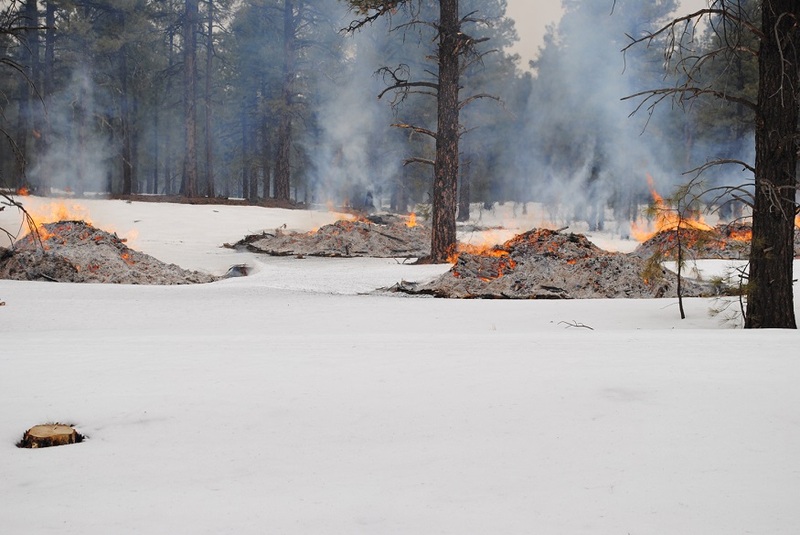 Numerous spring and summer wildfires linked to outdoor burning are started by slash piles that were burned the previous winter, some even with snow on the ground! What happens is that a pile may burn down and appear to go out but some of the material will get mixed with dirt underneath and smolder throughout winter and into spring. Then, with warmer weather, the ground dries out, the still-smoldering material finally gets exposed to air and nearby dry materials. The result? The next wildfire. No matter how sure you are that your wintertime slash pile burn is out, check the pile again — at least twice — when temperatures warm up in spring. How do I know if my land is protected from wildfire by DNR? Look at your annual property tax statement. If it contains a charge for the Forest Fire Protection Assessment (FFPA) then your land is under DNR’s wildfire protection jurisdiction. Owners of private and state “forest land” pay this fee to help support DNR’s wildfire preparedness, education, training and other protection activities. FFPA rates are established in law by the legislature (RCW 76.04.610), and are assessed on the unimproved forested or partially forested parcels, excluding structures. Want answers to your questions about outdoor burning? Contact your nearest DNR Region Office, 8 a.m. to 4:30 p.m., Monday through Friday.